Average mortgage rates held steady again on Friday. That means you still have to go back to January 2018 to find lower ones. Earlier in the day, it had looked as if those rates might have fallen further. And yields on 10-year Treasuries did end the day lower. Usually, mortgage rates shadow those, but they broke with them on Friday. That might mean there’ll be some residual downward pressure first thing, but markets themselves are quiet for now. 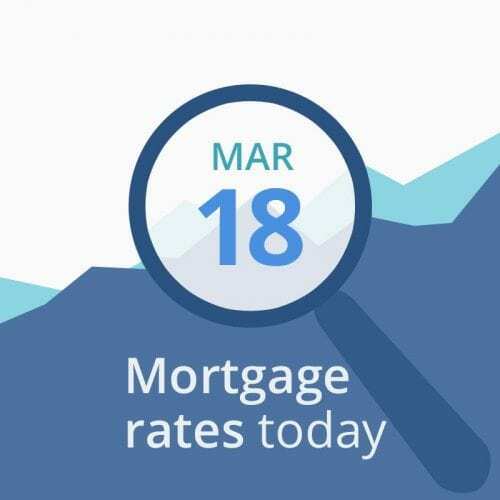 The data below the rate table are indicative of mortgage rates holding steady today or perhaps just inching either side of that. Unless that is, some unexpected, relevant and important news event occurs. Don’t be fooled by all those “good/bad for rates/borrowers.” Movements so far have been minimal and suggest a quiet day for mortgage rates. Of course, that could change through the news cycle. And, of course, there’s still a possibility of a less friendly outcome from the FOMC. That could see those rates fall even further. So there’s little certainty over the Fed meeting. And all we can do is wait and see. Last week, the UK parliament decided to request an extension to the Mar. 29 deadline on which the country is supposed to leave the European Union (Brexit). That’s good. Except there’s zero agreement on the length that extension should be or on what should happen during the extra time. And the EU has to agree to any request. The nation’s politicians currently seem incapable of finding any consensus for anything. And that means that the economic self-harm resulting from uncertainty continues. If those politicians eventually find a way forward, that would be good news for the global economy and might see mortgage rates rise. If the muddle continues or the country crashes out with no deal (still a possibility), mortgage rates could stay low or even dip further. Meanwhile, markets are increasingly focused on current U.S.-China trade talks. On Thursday, President Trump gave reporters a progress report: “We’ll have news on China. Probably one way or the other, we’re going to know over the next three to four weeks.” His original Mar. 1 deadline for an agreement passed two weeks ago. But both sides badly need a good outcome, and for similar reasons: to shore up political support at home and to step back from economic slowdowns. The exception is Wednesday’s FOMC statement, which isn’t really a data release. As discussed above, even that statement and its follow-up press conference might turn out to be damp squibs. Barring shocks, you probably shouldn’t expect fireworks this week from scheduled reports. Unscheduled news is a different matter.